Seasonal content is a great buzzword within the blogging world. But do you know what it is, how to write it, and how to promote it so that people actually see it in time for the season? Find out how! Have you ever tried to cash in on the seasonal content craze only to feel like you somehow missed the boat? There are a lot of reasons this might happen, but fortunately it’s easy to fix! 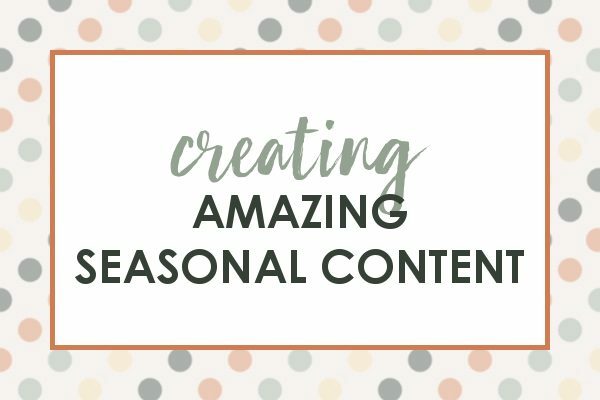 And once you know how to create amazing seasonal content, it’s simple to duplicate so that you can have high performing content for every season throughout the entire year! Seasonal content is a post that is not evergreen (meaning it’s relevant no matter when it’s seen). Additionally, there are two kinds of seasonal content: time-based (month-by-month, spring, summer) and event-based (Valentine’s Day, Tax Season, Christmas). Sometimes to two might overlap, but they aren’t exactly the same thing. While most posts have a place on social media, there are some that are only going to do well for SEO efforts. For example: A post on how to file a tax extension probably isn’t going to generate very many clicks from Pinterest or Facebook, but if it’s optimized correctly, it could generate a ton of traffic through SEO! Be aware of this as you write and attempt to promote (which we will talk more about later) so that you aren’t pulling your hair out and wondering why your tax post is bombing on Pinterest! When you’re planning seasonal content, try your best to do it in an evergreen way if you can. For example: My homemade marshmallows recipe is season neutral, but I can promote it during the summer (camping season), during Halloween (candy making season), during the Thanksgiving and Christmas holiday’s too. All by just changing the image that I send out to Pinterest, or by promoting the season neutral content with a seasonally appropriate comment to go along with the link. Facebook: Check out these homemade marshmallows! Perfect for campfire s’mores without all the junk! Facebook: Check out these homemade marshmallows! These make the perfect topping for sweet potato casserole! Yum! Pinterest: Just a non-season specific photo with the text “Homemade Marshmallows” pinned to seasonally appropriate boards. People will make the seasonal connection themselves! Promoting seasonal content needs to be looked at on a platform basis, because each platform has different lead-time requirements for how long it takes to get a good ranking set up. For example: SEO needs to be in place about 2-3 months in advance for a good ranking to be achieved for the seasonal searches. Whereas Facebook really only needs to be promoted at most 2-4 weeks before the season. Here is a break down of how far in advance to start promoting on a platform for best rankings once the season spike hits! Facebook: 2-4 weeks in advance start posting slowly. Increase as season nears. Pinterest: 2-3 months in advance start slowing sharing to season appropriate boards. Increase frequency as the season gets closer and closer. Instagram/Twitter: Since these platforms move so quickly, you really only need to post a few days in advance of the holiday – a week at the most. SEO: SEO really needs to be in place about 2-3 months in advance for a good ranking to be achieved for the seasonal searches. Read more about exactly how to best set up SEO. Newsletter Promotion: Depending on the length of the season, this one is a little trickier. Christmas can be promoted for a solid 6 weeks period, but Halloween probably only needs to be promoted a week in advance. Just be aware of the length of the season and when the spike is likely to occur, then determine what seems reasonable for that timeline. There are a few ways to get your seasonal content “out there” before hand without flooding your homepage with out of season posts. This is a great way to get your content onto your site if you don’t show dates on your posts. Publish your content as if it was written during the last year’s season. However, if you have dates on your posts, this isn’t the best idea because it can look like your site isn’t current. If you have a custom homepage feed set up (not your latest posts) then you can publish content whenever you’d like and only show it on the homepage during the appropriate season. This is highly preferable to the first option as it allows you to publish with more current dates. As easy way to get started with a custom homepage is to create a blank page and use the Content Views plugin to bring in only the posts you want. Examples – Both of the sites below use Content Views for their homepage configuration! Once you have a grasp on creating some seasonal content and promoting it well, it really does help bulk out your traffic while you’re writing on your normal topics as well!